Today is the 8th anniversary of Hurricane Katrina. More than 1800 people died as the storm ravaged the Gulf Coast in 2005. One year ago, my husband and I took a road trip along the Gulf Coast, heading from Houston to New Orleans to Biloxi, and on to Mobile. As we drove along the coast, we couldn’t help but notice all the damaged property still evident in the New Orleans area, and all the empty lots where houses once stood overlooking the Mississippi shore. 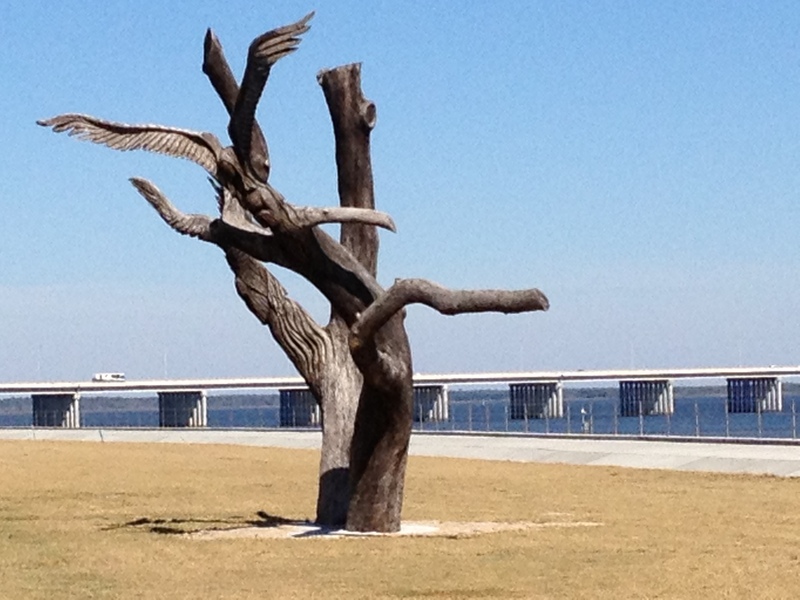 It was in Bay St. Louis where we spotted many extraordinary wood carvings in the medians and along the coast. 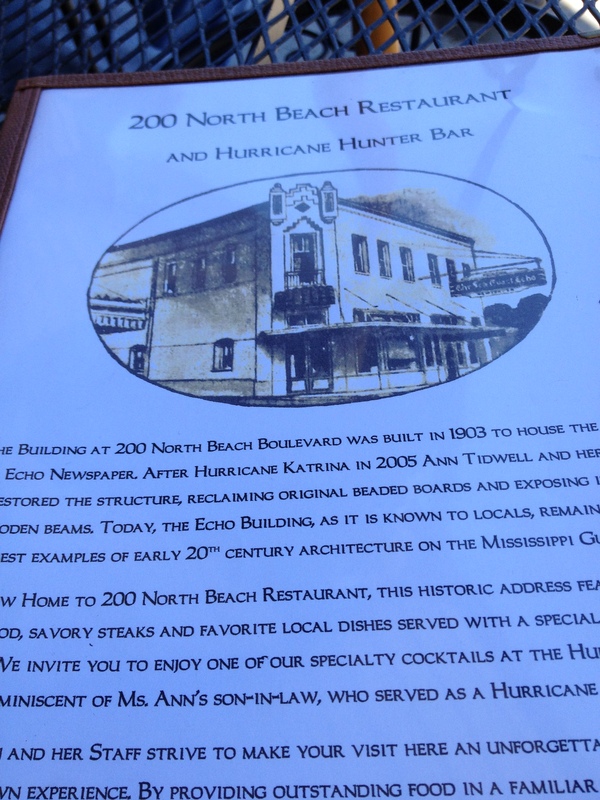 When we stopped to eat lunch at 200 North Beach Restaurant at Bay St. Louis, we asked owner Ann Tidwell about the tree that stood just a few feet from the restaurant. The tree’s branches had been carved to look like angels. She explained that the tree once stood in the yard next door, and that it had saved the lives of two people and a dog. They had held onto the tree for many hours as the storm and high waters raged. It is certain that a story such as this one about the horror of the hurricane accompanies all the wood carvings that we saw along our drive. We were told by Tidwell that chainsaw carvers “from the north” came to the area after the storm to make beautiful memories from the storm, by creating carvings of the old trees. By the way, this restaurant has an excellent menu, and we enjoyed our lunch sitting outside overlooking Bay St. Louis. Hope to return someday! 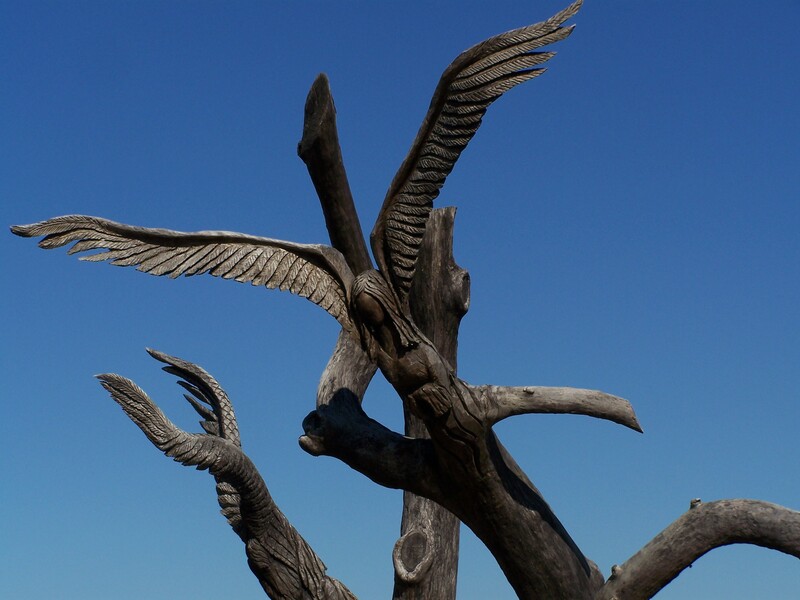 Built in 1905, the 200 North Beach Restaurant in Bay St. Louis, MS.
Remnants of Hurricane Katrina have been captured by art along the Gulf Coast in the form of wood carvings. This Angel Tree stands across from the 200 North Beach Restaurant as a haunting reminder of the 2005 storm. ← How many miles from Texas to Singapore?